Beautiful and fast, but too pricey, with a few unfortunate design choices. (+) Lake Superior: Bold styling; good performance; plenty of storage. (-) Lake Erie: Overpriced; terrible doors; no custom loop. For now, Intel’s new, high-end i7-6700K Skylake CPU is still somewhat hard to track down. You can, however, find them in prebuilt OEM machines, and Origin PC proudly sent us its new Millennium Skylake system to test. The system uses the same chassis, designed by Origin PC, as the Genesis we reviewed back in April. The key difference is that unlike the Genesis, it does not include the bottom bay expansion with radiator and extra fans, and is thus a midtower build to the Genesis’ full-tower setup. You can still orient the motherboard 90 degrees if you want to, or have it reverse-mounted (to face the other door), but ours has a traditional setup. The case comes in a wide variety of colors; ours is black and grey. The Origin PC logo in the front glows red, and to top it off, there are RGB lights inside the chassis that you can tweak through a variety of 16 colors with a wireless remote. The front of the case has a swinging door that opens to reveal the Blu-ray burner and five 5.25-inch front bays, which is pretty cool. Inside our particular configuration was a single 6TB WD Red drive. On top of the case you’ve got a fan controller and four USB 3.0 ports. Inside the chassis, the cable management and wiring is top notch. This isn’t to say the case is perfect, however. While the chassis uses a steel frame, the doors are plastic, feel flimsy, and are a huge pain to take off and put back on. To open the case, you have to lift up a latch on the back of the case, and the doors just fall off without warning. We felt like we were degrading the doors every time we took them off. Once you’re inside the case, you’ll notice the new star of the show. Intel’s i7-6700K is a 95-watt TDP proc using Intel's 14nm process. While the CPU carries a base frequency of 4GHz and a turbo speed of 4.2GHz, it’s a heavily overclockable part; Origin PC overclocked our unit to 4.8GHz. While we’ve experienced some over-aggressive overclocking from Origin PC in the past, this time around we encountered no blue screens. For cooling, Origin went with a 360mm closed-loop cooler designed by Asetek. While it keeps the PC cool and quiet, it’s a little disappointing to pay over four grand for a computer and not get a custom loop. All of this sits atop an Asus Maximus VIII Hero. With this mobo, we’re getting USB 3.1 and USB Type-C. Filling the RAM slots is 16GB of DDR4 clocked at 2,666MHz in a dual-channel configuration. For speedy storage, Origin PC outfitted our config with a 512GB Samsung SM951 PCIe M.2 SSD. And of course, who could forget the two GeForce GTX 980 Ti cards in SLI? These cards are overclocked to carry a base GPU clock of 1,195MHz, a memory clock of 1,853MHz, with a boost clock of 1,271MHz. Powering all of this is a 1,000W PSU from Corsair. Now for the most pressing question: How does the Skylake CPU perform? Quite well, as it turns out. Its aggressive 4.8GHz overclock allowed it to beat our zero-point’s eight-core 5960X CPU by about 21–28 percent in our single-threaded benchmarks. In our multithreaded CPU benchmark, however, the octa-core was able to flex its extra cores to thrash the quad-core part by roughly 30 percent. If you’re wondering how it compares to Devil’s Canyon, we saw roughly a -2 to 12 percent difference in single-threaded tests compared to the Digital Storm Bolt 3’s quad-core part we reviewed recently. Surprisingly, we saw a 14 percent bump in our multithreaded benchmark as well. Overall, it’s certainly not bad. GPU performance was good, too. The two overclocked 980 Tis were able to best our ZP’s three 980s by roughly 3–20 percent in all of our game tests. It did fall behind five percent in 3DMark Firestrike, but that’s most likely due to the the test leveraging multiple CPU cores in its physics tests. So, there’s a lot to like about this Millennium, but there are a few things that keep us from wholeheartedly recommending it. Aside from the absolutely terrible doors, the PC is overpriced for what you’re getting. For $4,370, you’d think you’d get a Haswell-E processor with more physical cores and a custom-loop cooler. As it is, it should be a couple of hundred dollars cheaper, but perhaps that’s just pie-in-the-Skylake wishful thinking. 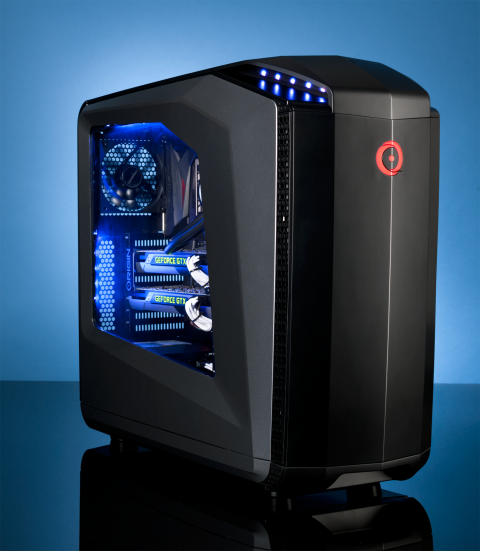 Our desktop zero-point PC uses a 5960X CPU, three GTX 980s, and 16GBs of RAM. Arkham City tested at 2560x1440 max settings with PhysX off. Tomb Raider at Ultimate settings. Shadow of Mordor at Max settings.